Painting on Canvas | 30" x 30"
My work is a way of expressing myself to the world. I have a sense of belongingness to the rustic and pastoral Indian lands. Furthermore, I reckon that the woman is the most magnificent creation of god. I draw women in extremely simplistic ways which is in fact contradictory to their power and potential. In my perspective, there can be nothing remotely enthralling as that of a village woman. Through my paintings, I seek to bring out their inner beauty and charm. Drawing women and the rural Indian lands serve me with immense pleasure and joy. Sachin was born in a rustic town known as Pandharpur but now resides in Mumbai, Maharashtra. He received a diploma in drawing and painting from Dalvis Art Institute, Kolhapur and subsequently, another diploma in Applied Arts from Abhinaw Kala Mahavidyalay, Pune. Sagare has developed his own unique style of charcoal painting. 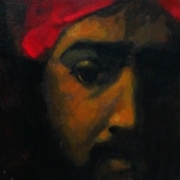 Apart from charcoal, he also works in oils, watercolors and acrylics among many more mediums and techniques. Majorly, he displays his mesmerizing works at solo shows organized by him at art galleries such as Artquest Art Gallery, Sahil Art Gallery and Jahengir Art Gallery to name a few.